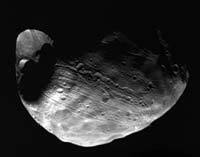 One of the most striking features of Phobos, aside from its irregular shape, is its giant crater Stickney. Because Phobos is only 28 by 20 kilometers (17 by 12 miles), the moon must have been nearly shattered from the force of the impact that caused the giant crater. Grooves that extend across the surface from Stickney appear to be surface fractures caused by the impact. Near the crater, the grooves measure about 700 meters (2300 feet) across and 90 meters (295 feet) deep. However, most of the grooves have widths and depths in the 100 to 200 meters (328 to 655 feet) and 10 to 20 meters (33 to 65 feet) ranges, respectively. This image is in the public domain and is copyright free. Copyright © 1995-2016 by Calvin J. Hamilton. All rights reserved.